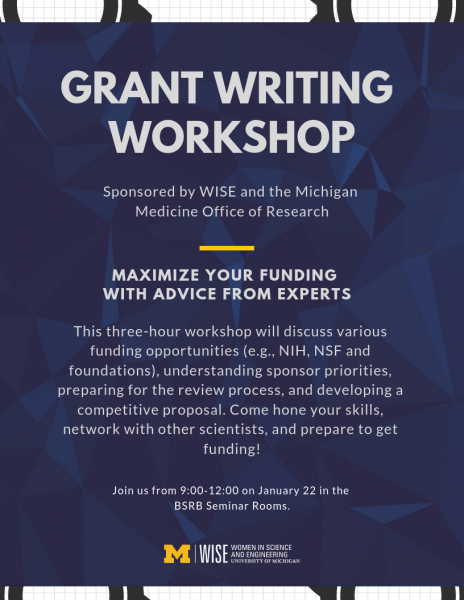 The University of Michigan Medical School Office of Research, in partnership with WISE, will be hosting a grant writing workshop for post-doc and graduate women. This three-hour workshop will discuss various funding opportunities (e.g., NIH, NSF and foundations), understanding sponsor priorities, preparing for the review process, and developing a competitive proposal. Come hone your skills, network with other scientists, and prepare to get funding! Join us from 9:00-12:00 on January 22 in the BSRB Seminar Rooms.